Somehow, I can’t stop telling him about my family. From our first conversations, to our first date, to last night on his couch as we were playing 20 questions. I always end up circling back to them; to my sister, who I spent two years missing while she was living overseas; to my mother, who I leave him on the weekends to visit; to my big family gatherings every holiday, how laughter and joy fills those days to the brim. We ask each other about what our perfect days look like—I tell him every day spent with my family is a perfect one. We are right in the peak of the holiday season, where dreams of home-cooked meals and sitting around a fire with loved ones play through our minds and the songs on the radio. Living close to home, where I can see my parents every weekend, take my grandma out for dinner whenever she’s willing, I would have thought this kind of holiday-induced homesickness would pass me by. Instead I find myself counting down the days until December 25th, eager to reunite with the people who make me, me. The people who love me would tell you that I have a tendency to get swept away by life. I invest myself entirely into a new job, or a new project, or a new person. I set goals I aim to achieve. I spend a lot of hours figuring out what I’m not doing enough of. I spend a month going to the same bar every weekend—the next month, I stay in every night. I work in extremes, for better or for worse. And whether I feel like I’m chasing the right paths, or realize I’ve spent too long going down the wrong ones, there is only ever one time where I step back, strip all the pieces of my life down, and go back to what’s important. When my family gets together, telling stories, giving updates, everything seems less monumental than it does when I’m on my own. No, I’m no longer with that guy. Yes, I got laid off from that job. Last week she was declared cancer free. Two months ago, my best friend moved back into the state. Good or bad, right or wrong, when I come back to these people, there is always a baseline of unconditional love. They don’t care about my Instagram or the number of followers on my blog. They don’t care that I haven’t gotten to where I want to go yet. They sing my praises for every little victory and pray over my sorrows every time I’ve been knocked down. They are my constants in a world where so much shifts, so often. A lot has been shifting for me lately. When I look back on 2017, I see so many different versions of myself. Hopeful. Joyful. Grief-stricken. Heartbroken. Stressed. Content. Ambitious. Exhausted. This year tested all of who I am, and at the same time handed me experiences I never thought I’d be lucky enough to have. But no matter the phase, I always return to my rocks. Find myself in the middle of a group of people sat around a table, unconcerned about the changes in my life because to them, I will always remain myself. The youngest cousin. The shortest granddaughter. A family member worthy of the same amount of love day in and day out, no matter where her life took her or left her behind. Whether in your friends or your dogs, your significant other or your family members, that is what I wish for you this holiday season. That no matter where you are, or what this year has handed you, you can spend the next few weeks going back to the people who know you at your root. You can let go, strip your life down, and remain standing with only the things you still want. The people who make up your own version of family. 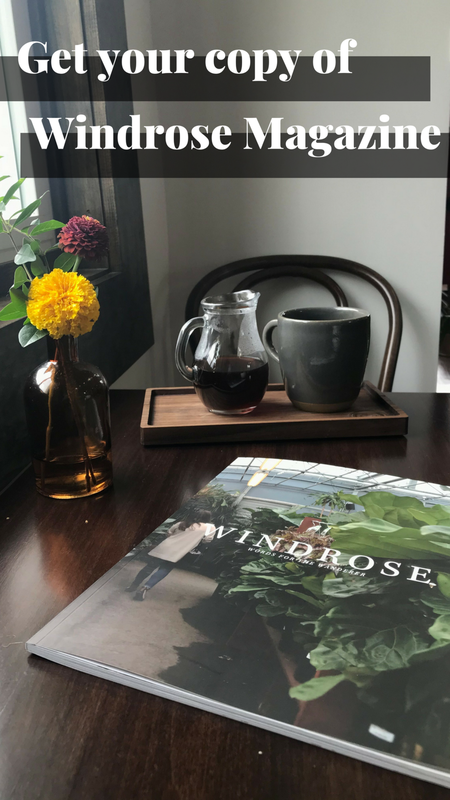 >>> USE CODE HBD2US AT CHECKOUT TO GET $5 OFF YOUR PURCHASE OF TWO (OR MORE) PRINT ISSUES OF WINDROSE. ONE COPY FOR YOU, ONE COPY FOR A FRIEND! GET YOUR WINDROSE COPIES HERE. Sale ends Tuesday, 12/19 at midnight. Receive this free downloadable Awake My Soul watercolor print with any Windrose purchase now through Tuesday at midnight! Last winter, as I hid under a blanket and bemoaned the graveyard that is modern dating in the city of Nashville, Tennessee (where every boy is contractually obligated to include in his I-don’t-actually-want-a-relationship script: “But I think you’re really cool!”), I told Chelsey that we should just stop having expectations altogether. Because rarely are expectations met, so why bother having them in the first place? I figured I could protect myself from any future disappointment by kicking expectations out completely. Expect nothing, I argued to her. I recently went through a breakup. I felt like I was on a train going through a tunnel. I couldn’t see clearly. I couldn’t think clearly. There were no mountains or trees, just a steady presence of hurt and confusion.